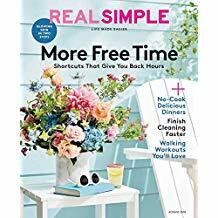 Real Simple is dedicated to making your life easier-every single day. Creates a positive, supportive and relaxing experience through which modern women can learn, connect and share inspiring ideas and smart solutions that make their busy lives more enjoyable. A one stop shop for healthy and delicious weeknight meals, home organization and decor, beauty and style, etiquette, health and wellness, personal finance, work-life balance and so much more.